GFDL scientists aim to advance our understanding of earth’s past, present, and future atmospheric composition and climate. 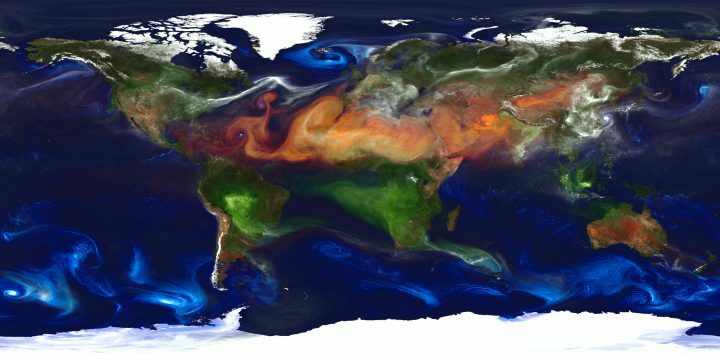 We develop sophisticated computer models representing the emissions, transport, chemical transformations, and sinks of trace gases and aerosols throughout the troposphere and stratosphere. Concentrations simulated by these models are evaluated using in situ and remote sensing observations. We attempt to advance the understanding of the impacts of atmospheric trace gases and aerosols on climate, surface air quality, ecosystems, and UV radiation fluxes. Lin, Pu, Yi Ming, and V. Ramaswamy, Tropical climate change control of the lower stratospheric circulation. Geophys. Res. Lett., 42: 941?948. doi: 10.1002/2014GL062823. Lin, Meiyun, Larry W Horowitz, S J Oltmans, Arlene M Fiore, and Song-Miao Fan: Tropospheric ozone trends at Mauna Loa Observatory tied to decadal climate variability. Nature Geoscience, 7(2), DOI:10.1038/ngeo2066. Bollasina, M. A., Yi Ming, V. Ramaswamy, M. D. Schwarzkopf, and Vaishali Naik, Contribution of local and remote anthropogenic aerosols to the twentieth century weakening of the South Asian Monsoon, Geophys. Res. Lett., 41, 680?687, doi:10.1002/2013GL058183. Fan, Song-Miao,: Modeling of observed mineral dust aerosols in the arctic and the impact on winter season low-level clouds. Journal of Geophysical Research, 118, DOI:10.1002/jgrd.50842. Kirschke, S, and Vaishali Naik, et al., : Three decades of global methane sources and sinks. Nature Geoscience, 6(10), DOI:10.1038/ngeo1955. Austin, John, Larry W Horowitz, M Daniel Schwarzkopf, R John Wilson, and Hiram Levy II, : Stratospheric Ozone and Temperature Simulated from the Preindustrial Era to the Present Day. Journal of Climate, 26(11), DOI:10.1175/JCLI-D-12-00162.1. Eyring, V, and Larry W Horowitz, et al., : Long-term ozone changes and associated climate impacts in CMIP5 simulations. Journal of Geophysical Research, 118(10), DOI:10.1002/jgrd.50316. Fang, Y, Vaishali Naik, Larry W Horowitz, and D L Mauzerall, : Air pollution and associated human mortality: the role of air pollutant emissions, climate change and methane concentration increases from the preindustrial period to present. Atmospheric Chemistry and Physics, 13(3), DOI:10.5194/acp-13-1377-2013.